Locate and hover your mouse over the file that needs to be moved within your file manager and click Move. Click the folder you want to move the file to, then click Move. Select the checkbox in the left column for each of the files you want to move. Towards the top of the screen, select Move. The number of files you have selected will appear towards the left of the Move button. Select your destination folder, then click Move. 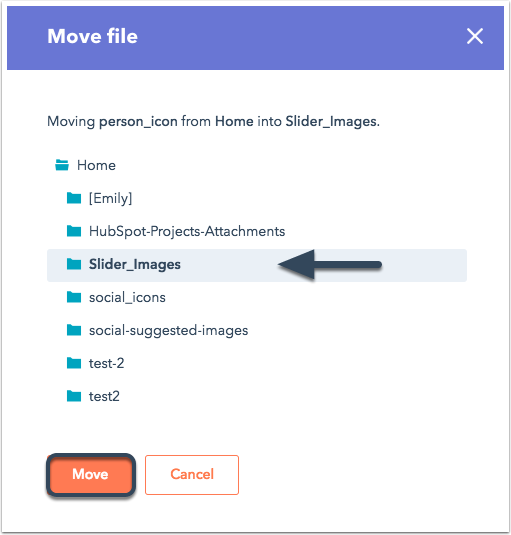 Please note: when a file is moved to a new folder in the file manager, HubSpot will automatically redirect the old file path. But, if you upload a new file with the same file name as a file you've already moved, it will stop the redirects for your original file.